When Justin Timberlake released his song ‘Can’t Stop The Feeling,’ it was an instant hit. It soared to the top of the summer music charts. Just like many of his songs, it’s catchy, it’s happy, and you can’t help but dance to it! A man named Josh Rinder filmed a video with his 6-year-old daughter Audrey — it’s the cutest thing to have ever been filmed. Okay, well it’s high up on the list anyway! This video was so good that Justin Timberlake himself felt like he had to share it. 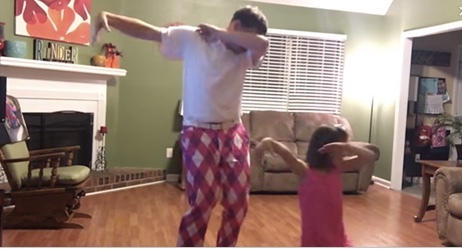 The adorable dad and daughter duo choreographed a routine to the popular song and decided to film it. Not only did they film it, but they edited it into an entire music video. It’s beyond adorable. “This is the cutest **** thing EVER,” Justin Timberlake tweeted with a link to the video. And if this talented pop and movie star thinks it’s worthy of watching, it probably is! He knows talent when he sees it. Another amazing this about this precious performance? They even color-coordinated their outfits to match. Oh, they’re both in pink, by the way. Continue to the next page to watch the video that caught Justin Timberlake’s attention. It’s so good!